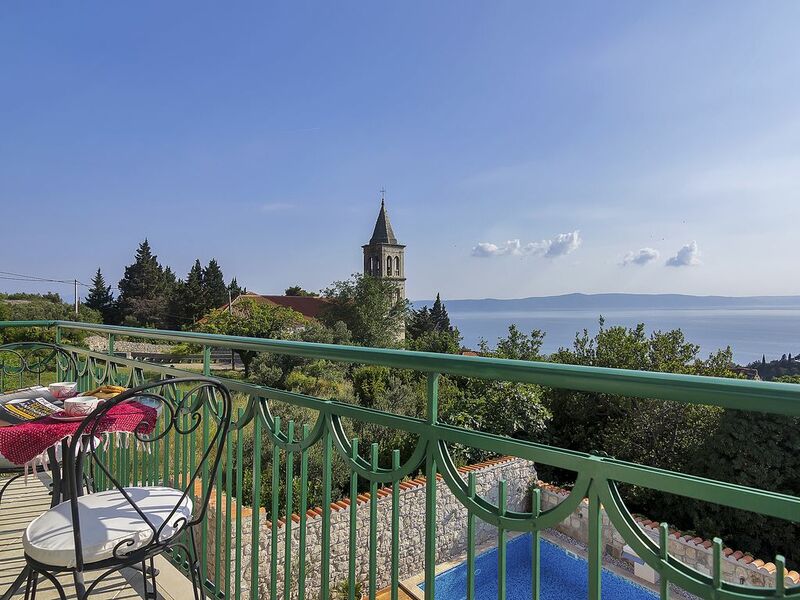 The lovely Dalmatian villa is located in the middle of Dalmatia between Split and Dubrovnik in the Makarska Riviera, in an idyllic town on the slopes of the Biokovo mountains, with a breathtaking view of Podgora and the islands around it. It is about 300 m above sea level. In the background, the massif of the Biokovo Range extends with its steep slopes and the gentle foothills, full of green olive and fig trees. Go biking or hiking through the Biokovo Natual Park, some 2 km away. Just relax and soak in the town's atmosphere, surrounded by the aromas of lavender and rosemary. Enjoy the lovely sunsets and the starry night sky far away from the tourist masses. In this idyllic town on the slopes of the Biokovo Mountains, you can enjoy the pool or the four balconies with a view of the sea. It is situated in a peaceful surroundings, not far from the town church, and was built in 1905, and subsequently renovated with much attention to detail. The rooms are large, with traditional stone walls that give off a special ambiance. Each room has a balcony or terrace, where you can enjoy a sunset with a good glass of wine. The large, rustic kitchen is on the ground floor, with a lovely garden and a 25-m2 pool and recliners. With a gorgeous view of the sea, 4 sunny terraces, a private garden with a pool and grill, we offer you peace and relaxation, near the beach and the Biokovo Mountains Natue Park. You can reach the fishing town of Podgora in 5 minutes by car or scooter. With its idyllic harbour and extensive stony beach, it offers chic cafés, restaurants and plenty of shopping options. The beach, 2 km away, offers plenty of water sport possibilities. You can go sialing, paragliding, water-skiing, rent a boat, or just go swimming or laze around in the sun. My name is Manuela, and I live in Croatia, the most beautiful part of the earth! I grew up in Germany, where I went to elementary school. In my free time, I like to paint, read, and -above all- travel! I love old things and make my living renovating them. Many of the items are on display on the house for you to see. My entire family works in tourism. As well as Villa Lavanda, we rent seaside apartments and own a ship with which my husband and son lead day trips to the islands of Hvar and Brac. Of course, our own guests get 10% off these tours. We love nature and produce out own hand-picked olive oil, wine, schnapps, and local liquor. Villa Lavanda is in the area of some of the best-known tourist attractions of the area: Dubrovnik, Split, Mostar, Zadar, Krka waterfalls,the Biokovo Mountain natural park, and Hvar, Brac and Korcula Islands. Our house is just a couple minutes' drive from the sea, yet in a very peaceful and romantic area. It is not far from the town church, and was built in 1905 and renovated with much attention to detail. The rooms are large, with traditional stone walls that give off a special ambiance. Each room has a balcony or terrace, where you can enjoy a sunset with a good glass of wine. There is also a lovely new pool with enough recliners. Kitchen: the kitchen is on the ground floor and is rustically furnished. However, it has all of the modern appliances such as a microwave, freezer, radio, CR player, gas/electric stove, and coffee machine. There is a large, solid olive-wood table that offers space for 6 people. Under the hand-finished stairs, there is also a small bathroom. Living room: the living room is on the first floor, and has a bookshelf, a fan, and satellite TV. The balcony boasts a special view. First bedroom: the first bathroom is on the ground floor next to the living room and has a double bed, air conditioning, and a spacious sunny terrace. Second bedroom: the second bedroom is on the second floor, and has a double bed, fan, balcony, and an en-suite bathroom. Third bedroom: the third bedroom is in the attic and has a double bed, air conditioning, bathroom, and a balcony with a breathtaking view of the entire Riviera. This is a lovely quiet getaway from the crowds, but located close to the small resort of Podgora. Podgora has everything you need in a holiday resort with lots of sea sports, good restaurants, shops and places to drink. It proved to be an ideal base for our family holiday (group of 6) but you will need a car. There is a path down to Podgora, not signposted but once found it is easy to walk down, pretty steep and takes around 25 minutes. We did walk back up once but it was hard going, especially in the heat and far better to get a taxi! The Villa itself is set in a small group of homes. Behind are some holiday apartments and next door another apartment, and the village is tranquil and very quiet. The inside of the villa is beautifully decorated, spotlessly clean very comfortable, a home from home. It has everything you need including towels and basic toiletries and kitchen essentials. The views are simply spectacular including the beautiful sun sets falling behind the island of Brac. The outdoor area has lots of sunbathing space (4 loungers and deckchairs) and the hammocks are a great addition. Again spotlessly clean. The pool isn’t heated but this was very welcome given the temperatures and the cleanest pool we have ever had. Manuela is the perfect host, nothing was too much trouble and was so helpful in booking several trips and excursions. This villa comes with our highest recommendation and we would love to return in the future; and finally thank you Manuela for allowing us to rent your home and provide a perfect vacation. I'm so glad that you loved my place and spent nice and happy moments there. I was very happy to have you in my house, thank you for keeping it safe as well as leaving it perfectly clean and tidy. Nothing could make me happyer, than welcome you again. Beautiful house in the hills above Podgora with pool and view of the sea. We enjoyed a fabulous week in this house in the hills above Podgora. Manuela was extremely welcoming and there was a plate of cold meat, cheese, olives and fig chutney in the fridge as well as a bottle of local wine for our first evening. She checked in on us during the week to make sure everything was ok. The house is beautiful, spotlessly clean, air-conditioned and tastefully decorated and we made full use of the pool and BBQ. All the bedrooms have balconies - the perfect place to watch the sun setting over the sea. There is a trampoline for younger children. We went to the local beach (we preferred the beach at Tucepi), as well as driving to Split and Mostar for a couple of day trips. We also went on a fish picnic to the islands of Hvar and Brac. On our last morning Manuela came to say goodbye and we left with two more pots of homemade chutney. Thank you Manuela for a great week. Thank you for your excellent review. I'm glad you had a great time in our villa and hope to welcome you again :) !!! Perfect retreat in the hills. Family all loved the house and the welcome from Manuela. Beautiful views of the sea, garden and lovely swimming pool. Podgora has plenty of restaurants and bars to enjoy. And location is easy from Split and it's possible to visit Mostar, which we particularly enjoyed, and Dubrovnik. Croatia and Podgora we will return to for sure. Town is a quick drive down a steep hill but os also walkable just about if you are fit to walk back! The villa is beautifully presented and has the most amazing views. The pool is a fantastic bonus. As a family of 6 we had plenty of space and all our needs were catered for. Fantastic location with breath taking views. Manuela was very welcoming and helpful. We would highly recommend staying here. Thank you for the excellent review. I'm glad you had a great time in our villa and hope to welcome you again :) !!! Very comfortable and well appointed house. Great pool. Didn't realise the neighbours would be so close but they were quiet so no issues. Owner charming, discreet and very helpful - particularly with help about local amenities. Got bitten quite a bit but was probably just unlucky! Thank you for your great review - hope next time will be better ;) !!! Wir haben es sehr genossen. Schöne Aussicht (von verschiedenen Terrassen) auf Meer und Sonnenuntergänge. Pool und Grill - einfach toll. Alles sehr liebevoll gepflegt und sehr nette Vermieter. Mitten in den Olivenhainen, in Meeresnähe mit vielen kleinen Buchten (einige Autominuten). Podgora ist ein hübsches kleines Dörfchen mit einigen Restaurants. Nahe zum lebhaften Magarska (mit Fähre nach Brac) und zum schönen Biokovo Naturpark. Podgora is in the heart of Dalmatia in the most ecologically lively part of the Dalmatian Adriatic, with the clearest water and the cleanest beaches. Podgora and Dalmatia are connected by various motorways to all European countries. By plane, you can come from the Split or Dubrovnik airports, which are just 1.5 and 2.5 hours away, respectively, on the Adriatic motorway. By car, the newly-built highways from the Croatian border from Rijeka and near Dagreb towards Dalmatia/Split, taking the Sv. Ilija tunnel. From there, it is about 30 minutes to Podgora. An alternative is a journey by ship with the car ferry from Rijeka to Split. The ferry leaves Rijeka in the night and comes to Split in the morning, where you’ll then have a 1.5-hour drive to Podgora. There are other road connections to Split via Italy. In any event, you can reach Podgora from Rijeka via the famous Adriatic motorway. This motorway is well-built and runs along the coastline with fantastic views from Rijeka to Dubrovnik. With excellent road signs, it passes by islands, mountains, beaches, and picturesque towns directly from the Makarska Riviera under the Biokovo Mountains, and then to your destination, Podgora. The famous monument of seagull wings indicates that you've reached Podgora!